Capsule Summary: Father Mulcahy tries to comfort a soldier who stole his friend’s identity, Charles and B.J. deal with a soldier who won’t stop selling annuities, and Hawkeye helps a soldier who received a Dear John letter. I think it’s fair to say that Father Mulcahy’s storyline is the A story in this episode. He’s understandably shocked to learn that a wounded soldier has stolen his buddy’s dog tags and discharge orders. Corporal Josh Levin died during battle. Corporal Gerald Mullen lived but plans to use the dog tags and papers to return home. Father Mulcahy tries to convince Mullen not to continue his charade but Mullen ignores him. All he cares about is going home. Mulcahy can’t give him forgiveness but also can’t break confessional. His only option is to somehow get through to Mullen. His solution? He reads Levin’s mail to Mullen. Here’s what I don’t understand. Did Mullen leave his dog tags on Levin’s body? Does the Army think he’s dead? If so, doesn’t he care at all that his family will be notified of his death? What’s going to happen when he shows up alive? Maybe he’s an orphan. If he didn’t swap dog tags, how does he expect to leave South Korea? Levin’s discharge isn’t for two weeks. Is Mullen planning to return to his unit after recovering, then go AWOL, become Levin, and head home? I don’t know anything about how the Army operated during the Korean War but I can’t imagine Mullen would get away with impersonating Levin. The B story, in my opinion, has to be the annoying Corporal Alvin Rice, hawking annuities to anyone who will listen. Rice goes after Charles first and later approaches Hawkeye and B.J., although we don’t see their initials interactions. Somehow, he manages to convince both Margaret and Colonel Potter to invest. We’re never told if they get their money back or stick to their belief they’ve made a solid financial decision. Charles eventually tricks Rice into not talking for 24 to 48 hours. In the tag scene, B.J. rushes up with a fake latrickiagram. Charles is bewildered, almost as if he has no idea what’s happening, but plays along brilliantly. Perhaps he did know. The scene works either way. Then there’s the C story: poor Private James Mathes and his Dear John letter. Hawkeye’s plan for revenge is ingenious: he collects dozens of photographs of women and writes a letter in which Mathes tells his former girlfriend he can’t remember what she looks like. Klinger’s role in the episode is limited to talking to Levin/Mullen about clothing, offering a picture of his cousin Num-Num to Hawkeye, and loading soldiers onto an ambulance for transport. Father Mulcahy listens to Corporal Mullen. “Identity Crisis” was produced during Season 9 but not aired until Season 10. This was the first of two episodes directed by David Ogden Stiers. The second was “That Darn Kid” later in Season 10. The two episodes are his only directing credits. Right after Mullen confesses to Father Mulcahy, there’s a fade to black for a commercial. 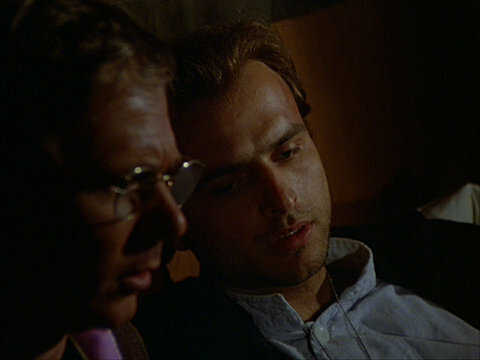 After the break, the scene picks up right where it left off, with Mullen resting his head on Father Mulcahy’s shoulder. This isn’t the only episode in which a commercial break splits a scene in two, but it’s not common. Is anyone else a little disappointed that Igor has both a wife and a girlfriend? Cpl. Rice stated he worked in Kansas City, but didn’t specify which one. My mom is from K.C., Missouri, and was born in Kansas. Cpl. Rice: People don’t plan to fail, they fail to plan. Great advice from a borderline obnoxious character. The rest of the episode is OK, if you go for crisis of conscience storylines. Concerning Mullen’s plan to impersonate Levin, what Father Mulcahy told him what would happen if he went through with it really resonated with me. Don Draper pulled off his own version of the Mullen/Levine switcheroo in Mad Men. I can’t imagine anyone being able to actually live a lie like that, but I’ll bet there are a few situations where it’s occurred. I think Mullen would have dropped the whole thing before he boarded the flight home from Korea. yea, if Mullen hadn’t talked to the padre I doubt he would have gone through with it. I honestly thought the Private Mathis storyline was the “B one. I loved Hawkeye’s plan & Mathis sending the letter postage due. As for Muellen, it would have taken more than dog tags to leave Korea-what about Levine’s driver’s license, or Army ID? I guess he just wasn’t thinking too clearly. Greatest thing about this episode was seeing a young Joey Pants playing Mullen. He’s a great actor. Amazing how different he is here from his evil character in the Sopranos. And he’s doing good his hair! Good episode for the most part. Classic late season MASH.